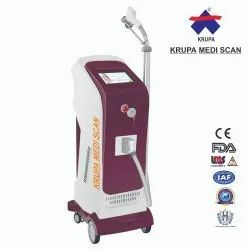 Our product range includes a wide range of triple wavelength 755/808/1064nm diode laser, diode laser silectron, diode laser suprimo machine, diode laser hair removal machine, hair growth machine and hair removal diode machine. 755nm Wavelength For the widest range of hair types and color. The Alexandrite wavelength offers more powerful energy absorption by the melanin chromophore, making it ideal for the widest range of hair types and color- especially light-colored and thin hair. With more superficial penetration, the 755nm wavelength targets the Bulb of the hair follicle and is especially effective for superficially embedded hair in areas such as the eyebrows and upper lip. 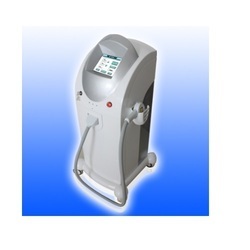 810nm Wavelength Half the treatment time.The classic wavelength in laser hair removal, the 808 nm wavelength , offers deep penetration ofthe hair follicle with high average power, a high repetition rate and a large spot size for fast treatment. The 808 nm has a moderate melanin absorption level making it safe for darker skintypes. Its deep penetration capabilities target the Bulge and Bulb of the hair follicle while moderate tissue depth penetration makes it ideal for treating the arms, legs, cheeks and beard. The YAG 1064 wavelength is characterized by lower melanin absorption, making it a focused solution for darker skin types . At the same time, the 1064nm offers the deepest penetration of the hair follicle, allowing it to target the Bulb and Papilla, as well as treat deeply embedded hair in areas such as the scalp, arm pits and pubic areas. With higher water absorption generating a higher temperature, the incorporation of the 1064nm wavelength increases the thermal profile of the overall laser treatment for most effective hair removal. In accordance with the clients’ precise needs and demands, we are betrothed in presenting an extensive array of Diode Laser Silectron. 808nm The Brand Of “Dilas ” Laser Bar Made by Germany. Big Spot Size. 12 X 20 MM cover treatment area instantly. 808nm The Brand Of “N-Light ” Laser Bar Made by USA. We are leading manufacturer of Diode Laser Silectron and we are mostly looking Buyer from Gujarat,Maharashtra and Rajasthan. Compressor Refrigeration cooling (Only in our Company) : TEC Cooling (Only in our Company) : Automaotive Cooling blanket. (Only in our Company). We are manufacturer of Hair Growth Machine. 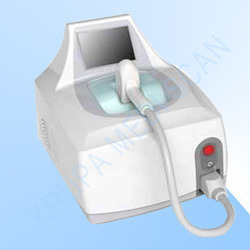 We are one the leading manufacturer and supplier of Hair Removal Diode Machine. 808nm The Brand Of “Dallas ” Laser Bar Made by Germany. Fiber HR is latest 810nm fiber coupled diode laser for hair removal and more applications, compared with normal diode laser, Fiber HR put laser generator in machine inside not in hand piece. So energy and heat transfer are released by fiber. Normal diode laser's hand piece is heavy, expensive but frail, but Fiber HR's is light and strong. So its hand piece can reach much longer lifespan 50 million shots, is durable with nothing consumable. Latest designed screen has three treatment mode, fast, classical and free setting mode, which meet more types of users’ operation by professional and full parameters. Fiber HR will add two more spot sizes of 4mm and 60mm for more applications like pigment and pain relief treatment etc. 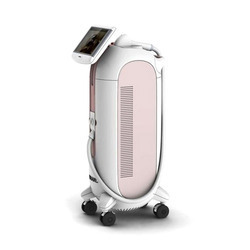 810nm diode laser is golden standard of hair removal. 810nm laser is absorbed mostly by melanin in follicle, reducing the absorption by water and hemoglobin. Suitable for all skin types. Comfortable and painless operation without side effects. The light generated by multiple diode laser are coupled into a single-core multimode fiber by micro lens array, in order to deliver light to the target place.